EaZy Electrical has delivered great service with our celebrated flat-rate pricing consistantly, year after year for Smyrna, GA.
Read our customer reviews in Smyrna, GA, and see how as local electricians we continue to be equated with quality and EaZy service. Plumber bear me in Smyrna is replacing a leaking water heater, we offer emergency pluming and electrical service in Smyrna GA. Licensed bonded insured electricians are installing new lights on the home. We offer electrical services in Smyrna GA.
Certified electrician performed a panel upgrade. Electricians are repairing ceiling fans, we offer ceiling fan, light fixture and receptacle outlet installation in Smyrna GA.
Certified electricians will be relocating wiring in the home, we offer electrical and plumbing repairs in Smyrna GA.
Certified electrician is replacing GFCI breaker. Electrician is repairing electrical power receptacle outlets, We offer electrical receptacle outlet repair and replacement. Electrician is installing new lighting, EaZy Electrical Services specialize in LED lighting. Electrician near me, in Smyrna GA is installing new power outlets. EaZy Electrical Services offers the best electricians in the local area. Electrician near me, in Smyrna GA Repaired an electrical short. Choose a licensed bonded electrical service company for your next electrical issue. Certified electrician is installing lighting in a basement. Installing a ceiling fan in home. Electricians are Installing a Tv over the fireplace. Its that time of year again, keep those attics cool to help manage that cooling bill! EaZy Electrical Services is offering installation of new Gable mount attic fans as well as repairing your existing attic fans! 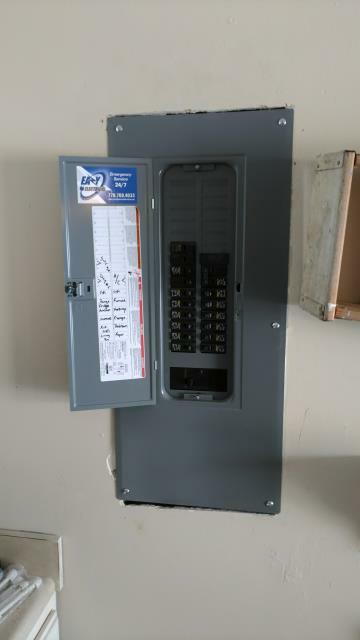 Electrician has installed new dedicated circuit an d surge protection for the home.